Maru and Moro’s clothes are so cute in this chapter! Wait… Is that… a new client?! She looks like that mermaid from a previous arc, or maybe it’s really her? Her dress looks mermaid-like, and she’s carrying the Shamisen too, so it’s probably her. 12 pages for this chapter — 44 pages so far for volume 4. 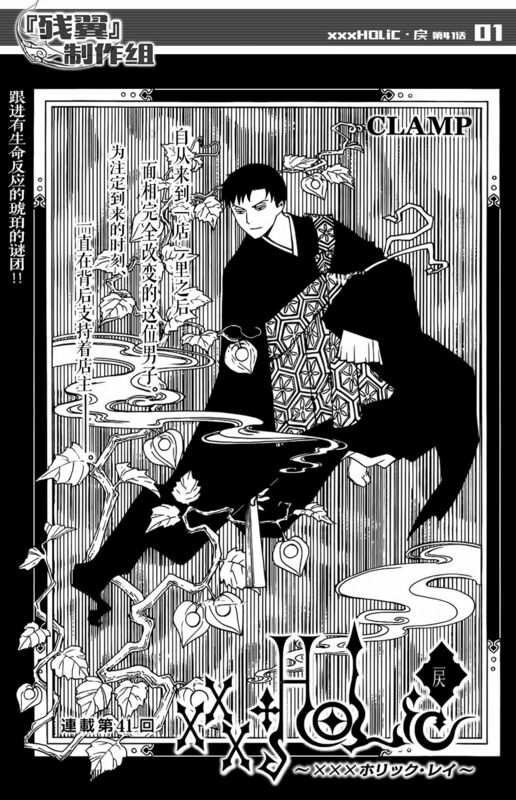 XXXHOLiC Rei will be going into a one-month break, next chapter will come out on June 29th. My guess is that they are planning a joint release of XXXHOLiC Rei #4 and Tsubasa – WoRLD CHRoNiCLE – #2 around September/October. On other news, Tsubasa will feature the front cover of the July issue of Shonen Magazine SPECIAL, out on June 20th, where chapter 10 will be published. The chapter will have color page(s) and a special service to get an exclusive set of 6 cork coasters is planned as well. Oh my, sorry about that! And thanks for letting me know, I’ve fixed it! I totally forgot. What chapter did the mermaid appear in the series? XD and belated thanks for the update!